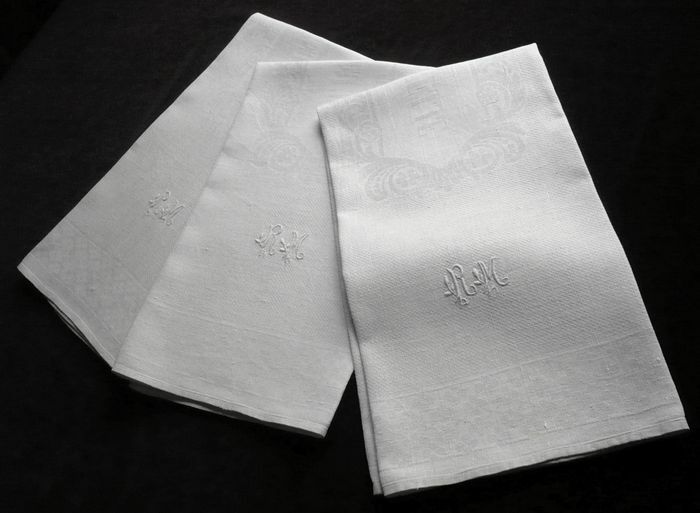 A charming set of three guest hand towels loomed of a crisp white linen damask with the word "TOILETTE" inscribed in an elaborate frame in the damask pattern. These pretty towels were clearly intended as decorative guest towels and bear an embroidered monogram, "RM," at one extemity. A stylized floral motif creates a frieze around the four sides. These lovely towels likely date from the early to mid 20th century and are in impeccable condition. Dimensions: 32 x 26in.